I know, I know, it has been a long time since I've posted something on here! I'm so sorry! It has been a very busy month this month, I had my first nursing practicum and it was incredibly fun and tiring at the same time. Due to my practicum, and being so busy I haven't been able to read much. Also I think I was in a slight reading slump this month which was horrible. Alas, it is May 7th, I am done my practicum, and I am going to get my s*** together!! 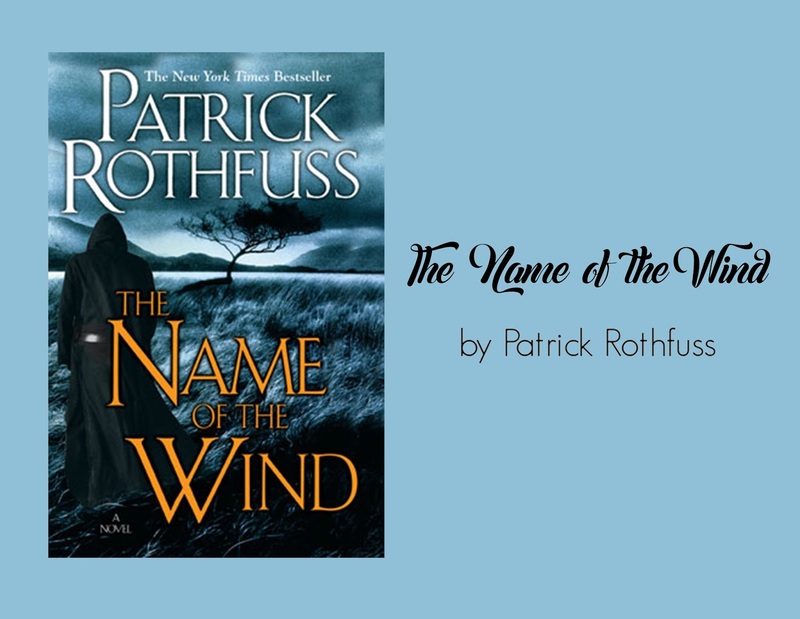 Today I will be discussing the novel The Name of the Wind by Patrick Rothfuss. This novel is something I've heard amazing things about, and I've been looking forward to reading for quite some time now. I read this book out of desperation to get out of my reading slump and it was definitely helpful. I loved it soooooo much. I love this cover, it's so dark and the lettering is so nice against that dark backdrop. Also I want to just take a moment to appreciate the floppiness of this novel. It added so much to my reading experience. 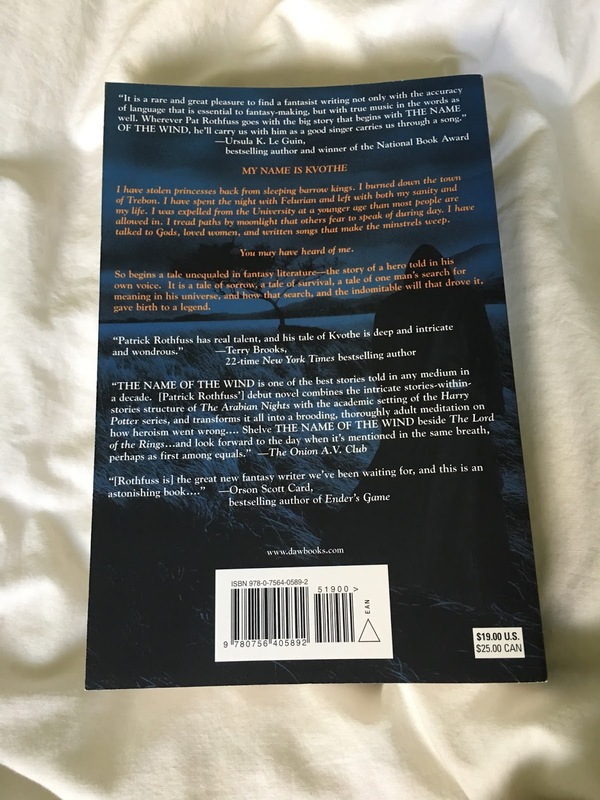 This novel follows the life of Kvothe beginning from his very younger years until his teenage/early adulthood years. In this novel you follow the numerous adventures of Kvothe as he figures out his life, it also includes an incredible magical school and the adventures Kvothe undergoes there. This novel includes stories of his years spent in a traveling circus (troupe), his years as an orphan in a horrible city, and then lastly his years in the university of magic. The only character really mentioning is the star of the novel. I love the way Kvothe was written. He is powerful and strong and witty and everything you hope for in a protagonist. Additionally, the way that he handles himself is so great to watch, but sometimes you question his choices. Kvothe as a young child was so innocent and just someone who is excited to learn absolutely everything, and you can see that as he grows up and goes to the University, that excitement doesn't go away, but the innocence definitely does. Kvothe's time spent as a poor orphan in Tarbean was my least favourite time in the novel, mostly because I wanted him to get out of that environment and thrive. This time was pertinent in making Kvothe the person that he is because it showed him the value of his money. His time in University kind of made him a bit more arrogant in terms of his powers and what he thought he could get away with, but nearing the end of the novel you could see the change from being an arrogant teenager to a wise and smart adult. I am such a big fan of this novel. I thought the storyline was amazing and it never made me want to set down this book. Additionally I loved all the adventures we got to go on with Kvothe as well as the fact that this novel made it feel like you got to see him grow up and see all the trials and tribulations of his life thus far. I'd have to say that the time in the University was definitely my favourite of all his adventures. Seeing him as an orphan was hard and it made me feel horribly for what he went through, and seeing him with his family and troupe was also hard because I knew the gut-wrenching truth about what would happen to them and how it would effect Kvothe. I need to point out that there is a bit of romance in this novel, and to be honest I'm not a fan of the leading lady (if she really is the leading lady). The girl that we see Kvothe like/love/lust after is very headstrong and, in my opinion, selfish. She doesn't stay with one guy for long and is never appreciative enough of what Kvothe does for her. I am hoping and praying that in the next novel we learn that she isn't really his final love interest and that we get to meet someone who is actually deserving of Kvothe's love, but we will have to see. All in all I was immensely pleased with how this novel turned out. 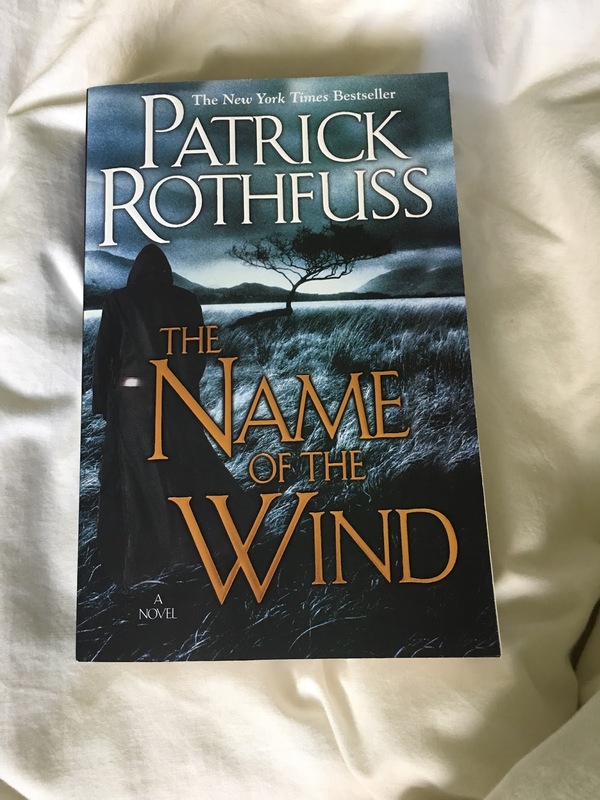 Patrick Rothfuss writes beautifully and in a way that will have you begging for more. Alright everyone! 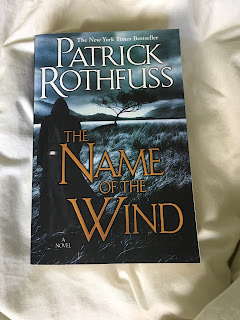 This concludes my spoiler-free review for The Name of the Wind by Patrick Rothfuss!